Wow! 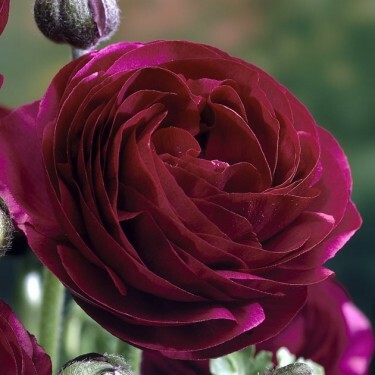 These deep maroon coloured blooms as just so pretty. Give them a good soak before planting and set them in a sunny spot - they'll thrive. Ranunculus have vivid double blooms and make an excellent bedding or container plant. Ranunculus, or Persian Buttercup, offers a showy display in bright shades of yellow, gold, red, pink, white and orange. Related to Anemones, these hybrid camellia-flowered buttercups come in many colors, from bright reds and golds to soft pastel pinks and whites as well as lovely picotees. Each plant will bear many blooms.